Date Rescue 5 Review - Should you buy this data recovery software? Data Rescue 5 is an impressively thorough data recovery software suite, but it comes with an imposing price point to match. Data Rescue 5 is a comprehensively featured data recovery program with a clean user interface and extensive configuration options to boot, but are all of these factors enough to earn it a spot among the greats? Read on in our Data Rescue 5 review to find out! Getting Data Rescue downloaded and installed on our test rig was a very quick process, taking less than five minutes from the time we were on the company’s website to the time we were running our first deep scan. That’s as fast or faster than competing products we’ve tested. Of all the data recovery software reviewed thus far, Data Rescue 5 has the most professional and clean layout of the bunch. This is good not only because it makes scanning easier, but also because it helps to make more sense of the huge number of configuration options available for each search. 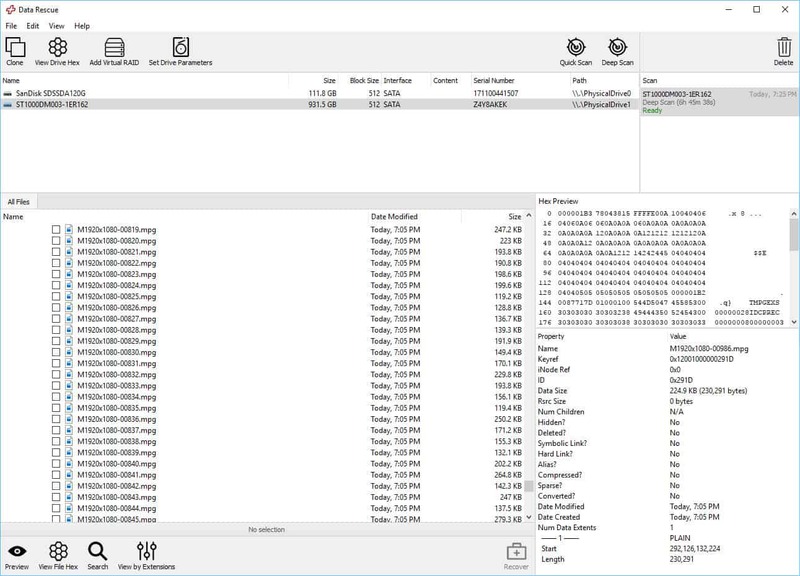 Everything from the filetype to the actual size of the file can be selected when deciding your search parameters, and one can whittle the process of getting a scan running down to some of the most granular options we’ve seen on data recovery software yet. This can make it easy to quickly send the recovery software off in the right direction to find the specific files you’re looking for, especially for expert users. But the process isn’t as intuitive as it could be, and might overwhelm more novice users who aren’t even sure what a filetree is, let alone how to accurately navigate one to search for the file they need. Data Rescue also allows Standard Licence and Professional License users to activate their software directly from the client, which is always a welcome perk in our book. 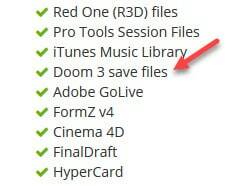 Data Rescue 5 supports a huge number of filetypes, most of which are common, some not so much (see image above). Another great feature is the addition of Secure Erase file deletion, and you can read more about how that all works in our breakdown of the technology here! 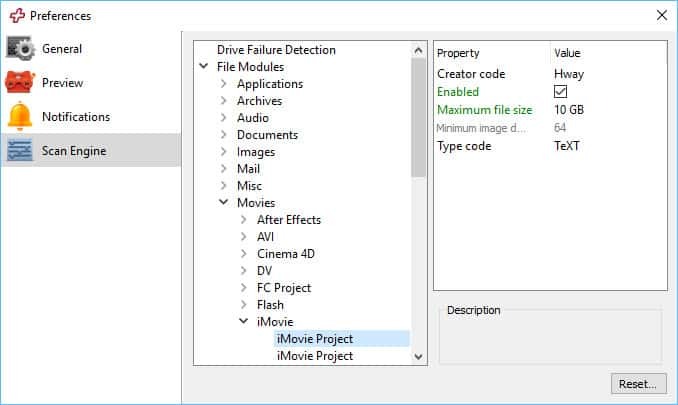 To test Data Rescue 5’s data recovery capabilities, we stored (and deleted) five different file types – *.exe, *.jpeg, *.mp3, *.zip, and *.txt – to see how it could recover data from an SSD, an HDD, and a USB flash drive. For the first test, I ran a basic scan on my 1TB Seagate 7200RPM to see what it could pull up. 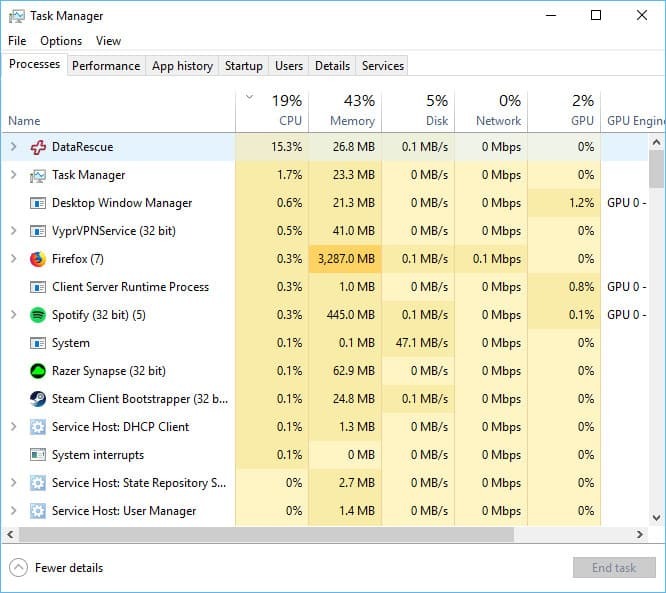 We recorded the length of how long the scan took on our test system, which features a 7th-gen Intel Core i7-7700K 4.2GHz processor (overclocked to 5.1GHz on closed-loop liquid cooling), 16GB of DDR4-3000MHz RAM, a 256GB m.2 SSD, a 1TB HDD, and an NVIDIA GTX 1070 GPU. We barely noticed any impact on our system while running the deep scan. Data Rescue 5 used about 15% of our CPU at maximum, less than 1% of RAM, and a mere 47.1MB/s on the HDD being scanned. For a full deep scan on the 1TB test drive, which searched for all of the 150+ filetypes that Data Rescue 5 is capable of recovering, we had to wait a painstaking 6 hours and 34 minutes, but the results we got back were well worth the wait. On every test run for each type of drive, Data Rescue 5 scored a perfect 100%. Not only did Data Rescue successfully recover the test files, it also got perfect marks on the file preview feature (no more corrupted family photos that look like some kind of glitch art gone mad). Data Rescue 5 is easily one of the least forgiving options we’ve reviewed when it comes to making you pay for a premium license, considering what you get out of the demo product. While most data recovery software include a free trial with a limitation like how much data you can recover (up to 500MB in the case of software like Disk Drill, 2GB with EaseUS, etc), Data Rescue 5 locks the entirety of its recovery capabilities behind the paid version. You can still scan drives and preview any files/folders that were found in the scan. In order to actually get them back you’ll have to pay the full $99 for a lifetime license to the regular Data Rescue 5 software. The same goes for the Professional version except you’ll pay $299 and only get a license for one year. A Professional license will allow you to install Data Rescue on as many hard drives as you want (opposed to the five drive limit in the Standard version), and will also give you access to more configuration options and search features in the main program itself. Many other data recovery software options cost around the same for a professional/technician-level license. Unlike Data Rescue 5 however, the price will net you unlimited access to the software rather than gating you behind a sole 12-month commitment. That’s far too expensive to justify paying every 12 months. If you need a professional license to work with, we’d recommend a number of other software options in this category like Stellar Windows Recovery, for starters. The makers of Data Rescue 5 (Prosoft Technologies) have two contact options on their website: email and live chat. Even though it’s nice to have it offered, one drawback here is Prosoft’s live chat is only open five days per week during the company’s actual office hours, 8AM – 5PM PST. If you’re awake halfway across the world on a completely different schedule, get ready to set a weird alarm to get a hold of a live agent. If contacting support via email sounds like too slow of a process for you (or too tiring in the case of waking up at midnight to start a live chat from Sydney), Prosoft offers an extensive knowledge base with tons of various support articles, including a wide range of questions answered on both its Windows and Mac recovery programs. Data Rescue 5 is, put simply, one of the best data recovery software suites on the market today. In my mind, the only real problem is they seem to know that, which is why the Professional version of their product costs $299 a year, rather than the standard flat fee that almost every other provider in the space charges instead. That said, if you’re able to work within the parameters of what the Standard license offers (which is still plenty more than what you get with most options), for our money and yours Data Rescue 5 is the data recovery software to get.